John Wilson Vermillion, known as Texas Jack Vermillion (also known as Shoot-your-eye-out-Jack) was born 1842, Russell Co. Virginia. He was the second of 12 children born to William Vermillion and Nancy Owens. When the Civil War erupted in 1861, Texas Jack joined the Confederate cavalry under the command of General J.E.B. Stuart. After the war Texas Jack married Margaret Horton on September 6, 1865 in Sullivan Co., Tennessee. The newlyweds moved to eastern Missouri where Jack accepted the position as Territorial Marshal for the eastern section of Missouri. A daughter was born and named Mary and a second child followed. His name is unknown. Within a few weeks of the son's birth and while Jack was away from the home a diphtheria epidemic rambled across eastern Missouri killing Margaret and the children. It has been written that grief stricken, Jack moved west. He surfaced in Dodge City, Kansas were he drank heavily, gambleed frequently thus gaining a reputation as a " devil-may-care" gunslinger. It has also been written that when Dodge City burned for the first time that City Marshal and Deputy U.S. Marshal Virgil Earp rounded-up 23 men he could trust to prevent lot jumpers. One of those men was Jack Vermillion. Family history tells a story that Jack turned up in Montana and became involved in a saloon fight. Jack wasn't doing so well until someone stepped in to help. That someone was Doc Holliday. The legend continues that many years later Jack received a trunk shipped to him from Holliday. As portrayed in the movie Tombstone, it has been written that Jack killed a man who accused him of cheating at cards. Unlike the movie, the gunfight was viewed as unfair and Jack became a wanted man. It was on the wanted poster that his name first appeared as "Texas Jack" Vermillion. Texas Jack rode with Wyatt Earp during his vendetta ride and again was with Wyatt during the Dodge City War. He was considered a crack-shot with a gun by those who knew him. He married a second time in Big Stone Gap, Virginia 1883. He met and married Nannie Fleenor. 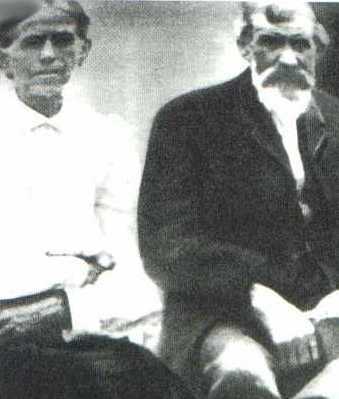 They had two children, son Opie and daughter Minnie Bell. Vermillion joined up with the Soapy Smith gang in 1888 or 1889, and was involved in the Pocatello, Idaho train depot shoot-out, in which a rival gang was trying to kill Soapy. He disappeared from known gang movements, but was reportedly involved in another gunfight in 1890. Jack killed another man in an apparent " fair fight" but shortly after the killing Jack and family moved 60 mile east to Mendota. In 1911 Jack passed away quietly in his sleep. Some family historians suggest that young Texas Jack was of slight build, standing only about 5'-2" tall and weighing around 125 lbs., but that description has never been confirmed as accurate. A book titled, American West A Historical Chronology by Keith Cochran lists in the appendix section colourful names of the old west & on page 414 it lists Texas Jack & Shoot-Your-Eye-Out-Jack as the same person. The exploits of "Texas Jack" Vermillion's time in Dodge City and Tombstone are reasonably well-documented in two very well-researched books. The first is entitled "Wyatt Earp's Thirteen Dead Men" and was written by Ben T. Traywick. The second, a very scholarly treatment of the Earp brothers' posse that hunted down the killers of Morgan Earp, is entitled "And Die in the West: The Story of the O.K. Corral Gunfight" by Paula Mitchell Marks. 1910 Washington Co., VA Census 4/16/1910 Kinderhook Twp Ed107 Sheet 1A. Vermillion, John W., 66, Head, Married once, Married 35 yrs, VA VA VA, Farmer. Vermillion, Nannie, Wife, ?6, Married once, Married 35 yrs, VA VA VA.
Faller, Charlie, Step-son, 12, VA VA VA.